Mary Sherman recently met over a beer and burger. Mary was interviewed by the media in China. Last summer she danced in a catle in Romania. 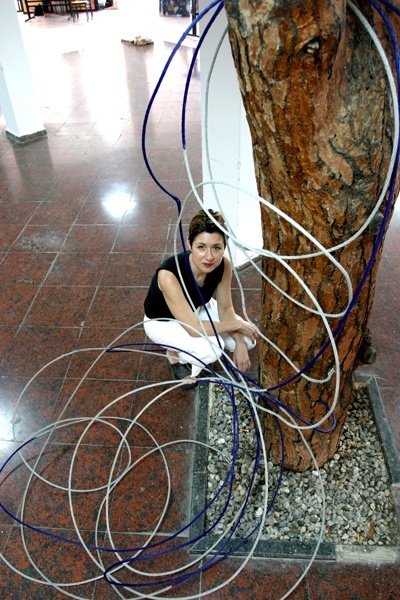 Or posed with her work in Turkey. With artists in Taipei last summer. This was her studio in Taiwan. 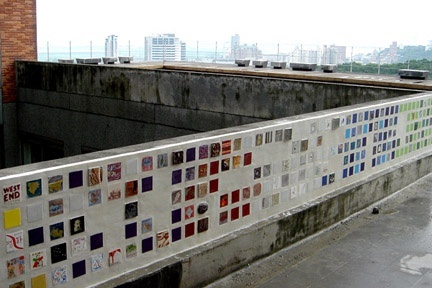 The Tile Project installed in Taiwan. 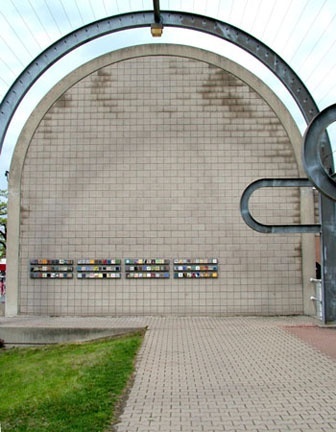 The Tile Project in Toronto. 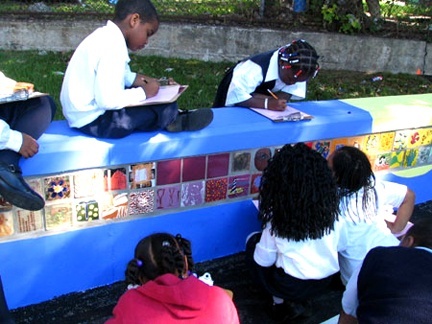 Tiles in Boston enjoyed by school children. 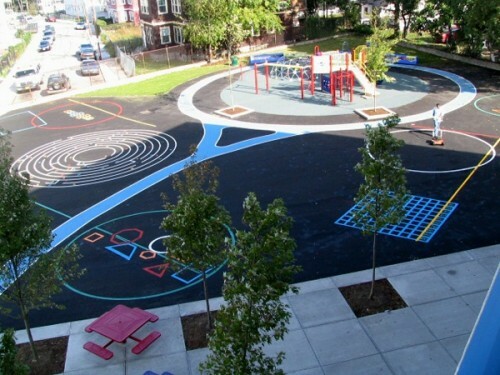 Sherman designed the graphic patterns for this Boston playground. Mary Framed by her work woth Dorothea who runs the residence prpgram in Romania. From April 27 through 29, 2007 there will be a "Conference on International Opportunities in the Arts" hosted in Boston by TransCultural Exchange. Representatives of artist residencies, museums, individual artists, curators and critics from all over the world will present panels, workshops and lectures intended to facilitate international residences and cultural exchanges. There will be opportunities for one on one meetings between artists and administrators of programs. One of the highlights of the event will be a panel "Biennales and Documenta" including curators Linda Norden, who was an American commissioner for the 2005 Venice Biennale, Ute Meta Bauer, Co Curator of documenta 11, Yung Ho Chang, an architect and participant in the Venice Biennale, and Tala Moualla coordinator of the International Symposium in association with the Sharjah Biennial. This past summer my artist/ curator/ critic/ educator friend, Mary Sherman, spent ten days in a castle in Romania, came home, was off for a residence in Taiwan, came home, and then scooted off to China. To pay for all that travel she teaches six courses each semester as an adjunct at several colleges. In the midst of which she spends time in the studio as well as working with technicians and fabricators to make complex multi media mechanical pieces that combine painting and sculpture. Toward that end she had a recent fellowship at MIT in the Department of Mechanical Engineering. Which made her dad, now deceased, himself an engineer, particularly proud. Mary states that she was always good at math but opted for a life in art. "I type 60 words a minute," she informed me exuberantly as we met recently over a beer and burger. "So I can always work as a secretary." Which she did for many summers temping between semesters. She went back to school, commuting to New York, to earn an MFA degree. Despite the grueling schedule and challenge of making ends meet without a full time job she considers herself fortunate to be teaching in a field for which she trained. "I always saw myself one day as a waitress painting in a small studio so compared to that this is good. I am happy. Most of all I just want to do my own work." On a couple of occasions I have shown that work in a one person installation for my gallery program at the New England School of Art & Design at Suffolk University. And we also installed her Coaster Project which included one hundred artists making one hundred coasters for one hundred global venues. At the end of each project the coasters, which in some instances were actually used as such in hip pubs, were distributed free to patrons and visitors. You may also visit the site for an evite and registration form for the Boston conference which costs $150 or $225 after January 2, 2007. Or write to them at TransCultural Exchange, 518 East 2nd Street, Suite 30, Boston, Mass. 02127. The fees are applied toward plane tickets to fly in the delegates and to provide lodging. There is also support for the conference from the LEF Foundation, The French Consulate (Boston), The Boston Mayor's Office of the Arts, Tourism and Special Events, Northeastern University, Delegation du Quebec a Boston, and McDougal Little, a division of Houghton Mifflin Company. As always she has a lot on her plate. And on this occasion a nice juicy burger accompanied by a Sam seasonal. It is always fun to catch up but she had so much information to convey that I was writing furiously. Overall she looks much the same as when I first met her in the early 90s when she and her then husband, Peter Keough, a film critic for the Boston Phoenix, moved here from Chicago. 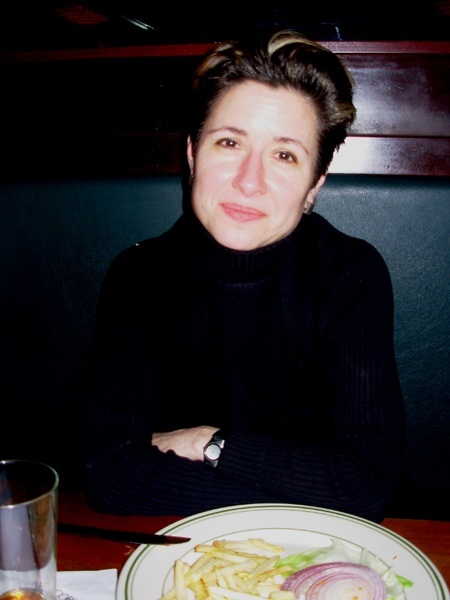 Initially she was a stringer writing art criticism for the Boston Globe under former critic, Christine Temin. In a way she was set up by being assigned to the kind of mediocre, mid career artists whom Temin preferred to ignore. Mary chewed them up. Oh my. She was just being honest but in the process stepped on toes and, at the time, I let her have it in print. Later she wrote for the Boston Herald which has subsequently pretty much phased out of covering visual art. And then for the blog of WBUR which has also ceased. So she doesn't do much writing today which seems ok with her. She much prefers making and promoting art to writing about it. But it is always fun to tease her a bit about when she arrived in town and nipped at the heels of the local sacred cows. Most of those comments were accurate and richly deserved. But we later patched up differences and have been great allies since. Even though, like all busy people, we rarely get the chance to interact. Which is precisely the point of the beer and burger series. "I started TransCultural Exchange in Chicago in 1989," she said. "I had spent time in Vienna and wanted to show a group of artists in Chicago as well as bring emerging Chicago artists to Austria. The Ludwig Drum factory building was about to be converted into condos and we had some 13,000 square feet available. I knew Ed Paschke and he agreed to show his work with us. We organized an auction and raised $10,000 to fund the project which included 35 Chicago artists and 35 artists from Vienna. The exhibition was up during Art Expo Chicago which is how I met Howard Yezerski (Boston dealer). The artist Paul Shakespeare told him about our show and brought him over. The show then traveled to the Kunsthalle in Vienna. The project included film, poetry and photography and included a catalogue to which Wim Wenders contributed an essay. The exhibition was called 'Reverse Angle' which is the title of one of his films." In Chicago she was the art critic for the Sun Times and was represented by "good galleries" first Gallery Vienna and then Oskar Freidl who now runs the Zhou Brothers Foundation in Chicago. She continues to work with Freidl who has helped to make contacts for her in Asia including a connection in Beijing to bring the Tile Project there during the Olympic Games. Much of what Sherman does comes through constant networking and may be described as opportunistic. While attending graduate school at NYU, for example, she met Joseph Szoecs who runs Trans Hudson Gallery. He was going away and offered use of his space for August, 1998. She revived TransCultural Exchange and brought together artists from Korea, Brazil, Boston and New York for the show "No Boundaries." The project was reviewed in the New York Times by Ken Johnson who has recently been appointed as senior art critic for the Boston Globe. The Korean participant Sunghoon Yong arranged to bring the exhibition to Kwanhoon Art Gallery in Seoul. "I saw an ad in Art Forum which was a call to artists for the London Biennale," she said. "But there was a hitch. Applicants had to include a photo of themselves holding an arrow in front of Piccadilly Circus. Also, you had to find a location to show your own work. So there were challenges. We contacted our artist friend in London and through Photo Shop we were able to get the Piccadilly photos that were required. Then we came up with the Coasters ideas and found some pubs to agree to use them as our project for the Biennale. We contacted Jennifer Atkinson (now deceased) the director of the Fuller Museum of Art in Brockton, Mass. about taking on the Coaster Project. She turned it over to the museum's then curator, Denise Markonish. 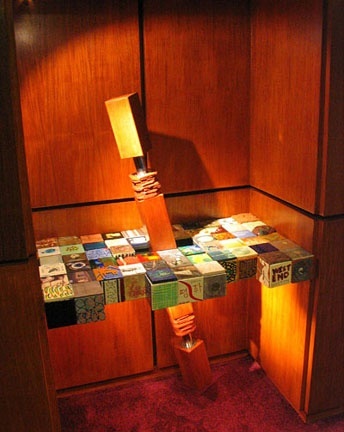 The resultant show included the members of the TransCultural Exchange and an installation of the 100 Coasters. This later led to the Tile Project." And just how many individuals does TransCultural Exchange represent? Mary stated that there are about 22 global core or contact members as well as 100 plus artists at any given time participating in specific projects. "It's a lot of people," she added with emphasis and growing all the time. The challenging part is to come up with interesting concepts and doable projects. 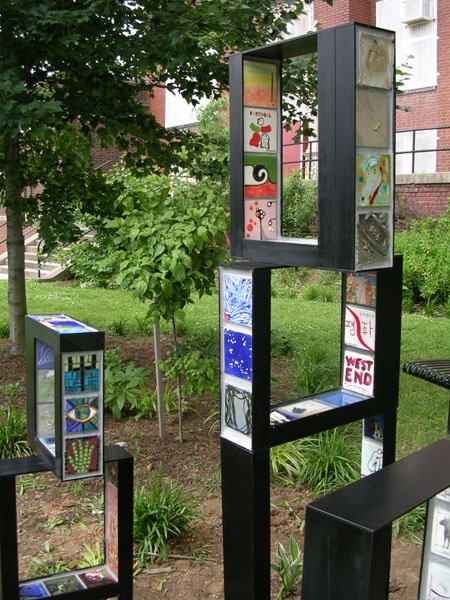 The idea for the Tile Project emerged while she was a resident at MIT in 2002. She was working with the laser jet cutter and in the glass lab. "The idea of the tile project is that it was easy to create, ship and install. Tiles represent one of the most ancient and democratic forms of art making. As they have traveled around the world it is interesting how each group or venue opts to install them differently. So far there have been 22 global sites. Each 'contact' artist went to another site. So an artist from India, for example, went to Spain. They each get an airplane ticket and stay with other artists." The nature of the projects is ephemeral particularly when the individual works are dispersed such as the Coasters. So she wanted to create a document in the form of a catalogue but there was no money for publication. When doing multi national projects fund raising is particularly difficult. A nation may be willing to sponsor its own artists but not in ways that benefits artists of other nations. But because of the Tile Project in Boston she was able to get $1,500 in seed money from the Boston School Year Initiative. Next she approached the George Soros Foundation which eventually provided $5,000. Estimates to print the catalogue in the US were about $20 per unit. Which would have been a $20,000 publication but taking it to Taiwan last summer she was able to print the thousand copies for the $6,500 she raised. The resultant publication is both exquisite and a triumph of entrepreneurship. Does she make any money on these projects? This produced a good laugh from Mary. "I loose money," she said. "My accountant is appalled. He says 'Why don't you spend this money on dresses?' But I don't need dresses. I just want to make my own work. I built my studio and am quite happy there." Actually, don't get me wrong. Mary does have a great, understated, unique sense of style which tends to the basic. She cuts her own hair, for instance, which has been precisely the same length and look in the years I have known her. She has a chic and hip image. What more could a girl ask for? Who needs dresses when you have something greater, style? But try to explain that to her accountant. I hope some day she starts to get the kind of recognition and grants that she deserves. The good news is that now much of her travel and residencies are subsidized. 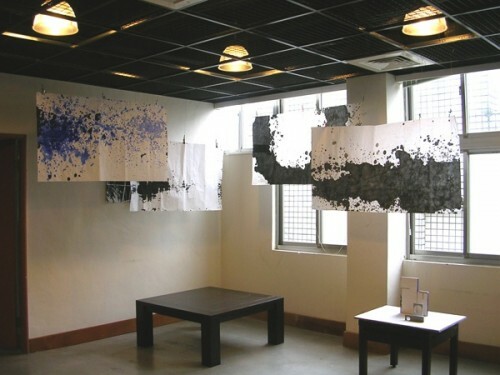 When she visited Taiwan for the Tile Project she was invited for a three month residence and studio by the Taipei Mayor's Commission on the Arts. Five people are invited each year for that residence but there are also 20 studios available for informal exchanges. During her residence she gave six lectures and was a media star. Mostly she is asked by artists about how she gets to do what she does. The answer is "Just do it. If I were waiting for it to happen nothing would happen." This summer, for the second time, she was a resident in Romania. The best part of that was connecting with two artists/ curators from the Middle East. It was a part of the globe that had been particularly difficult to contact. Now she has a direct line and will work with them on future projects. She has a charming and efficient way of hooking you into her vision. I was one of the hundred participants in the Coaster Project. Now she wants me to make a tile for Beijing. How can you refuse? And, with a twinkle asks if I will take photographs during the Conference. How can one say no? There's just something about Mary. "What a waste of money! These abstract so-called modern artists would make Rembrandt, Hogarth, Gainsborough, et al, puke if they could see what's going on in the art world. " "What is the connection between Middle East and Romania?"